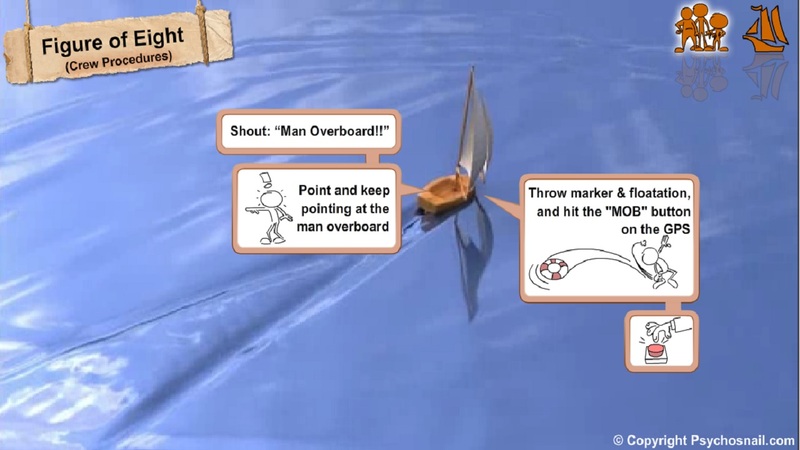 Anyone who views the person go overboard shouts, “Man overboard” and should continue to point in the direction of the MOB. Immediately throw MOB marker and buoyancy to help the person stay afloat. Throw floatation devices upwind of the MOB, so that they drift toward the man overboard. That includes life jackets, life rings, or floating boat cushions, daytime orange smoke, dye marker, dan buoy with attached life ring, or simply anything that floats. Shout words of encouragement, stay calm, and maintain an eye on the MOB as it is very easy to lose sight of someone in the water. Hit the MOB button on the GPS if available. The skipper should brief the crew on the recovery procedure and make everyone aware of what method will be used to retrieve the MOB. If you lose site of the MOB for more than a minute, issue a mayday call on the VHF. It can always be canceled if the man overboard is located. While in man overboard procedure, have a crew member prepare a floating line or if a floating line is not available a line with a large loop. Once close to the MOB the skipper will give directions to throw a floating line to the MOB. Instruct the MOB to put the line around his body and under his arms. Slowly pull the MOB to the boat making sure that he/she is able to keep their face above water. Do not pull them in to quickly or they could go under. Once the MOB is alongside the boat, get them aboard. My personal preference is to use the engine wherever feasible (see under sail with engine below). These methods are good in theory but they largely depend on the competence of your crew and the weather conditions. If you have a reliable engine that starts easily and runs consistently, it can be quicker and safer to simply start the engine and drop the headsail. I would start the engine irrespective of whether you use the engine method or are using sails as this gives the opportunity for more control. Of course care needs to be taken not to allow the propeller near the MOB or for any sheets or lines to get caught in the propeller. The figure of eight method is the most commonly taught and best used in heavy seas when strong wind conditions are present. It is also best used when there are crew members available to help with the retrieval. Figure eight also seems to be the most commonly taught method. If you are only going to learn one method this would typically be it. Immediately put the boat into a beam reach. A beam reach will give you room to maneuver and to retrace your steps when you tack back in case you lose sight of the MOB. A beam reach will also ensure that you are not against the wind during the rescue. Approach on a close haul. A close haul point of sail is best because it gives you the ability to quickly slow the boat by heading up or speed up by falling off. Going directly into the wind will not allow the boat to make headway, in irons. As you approach the MOB from a downwind position turn into the wind. Depending on the size of the boat and the strength of the wind determine if a leeward or windward rescue is more appropriate. The US coastguard recommends retrieval to windward in a larger boat and retrieval Leeward of the MOB in a dingy. Bear in mind that the boat will drift considerably with strong wind and you don’t want to drift over the MOB. On the flip side you don’t want to drift away too fast because you could miss the retrieval and would then need to repeat the drill. Depending on the country and association the recommendations for a leeward or windward rescue differ. As always it’s better to use you best judgment for the situation at hand. This method can be used when there are limited crew members to assist with the retrieval as nothing has to be done to the jib sheets and only the mainsail needs to be centered. It is also the best method for keeping the MOB in sight. This is not the best maneuver during heavy winds as the boat will catch a lot of wind at the top of the tack. Tack the boat as soon as possible. Do not touch the jib sheets and as the boat comes about allow the jib will back. While tacking, the main sail should be brought parallel to the boat. This will decrease boat speed and the backed jib will help turn the boat. Do not touch the sheets, keep the rudder in the same position and complete circles around the MOB. When the boat is below the MOB and there is sufficient space, gibe and head up to the MOB. When the time is best, pull up the MOB from a leeward position and stall the boat beside the MOB. Remember you want to throw a floating line to the MOB if possible and as soon as you are within distance. This method is not sanctioned by any official sailing body. However, in reality it can be useful and practical if you are close to the MOB and the skipper reacts quickly. Turn the boat straight into the wind putting it in irons. The boat should stop in a few boat lengths depending on the size. Make sure the rudder and sheets are controlled to avoid the boat turning and catching wind. Always take into consideration the size/windage of your boat and the strength of the wind. Some boats will drift backwards faster than others. Lower the sails to help hold your position. Throw a line to the MOB when you are within distance. 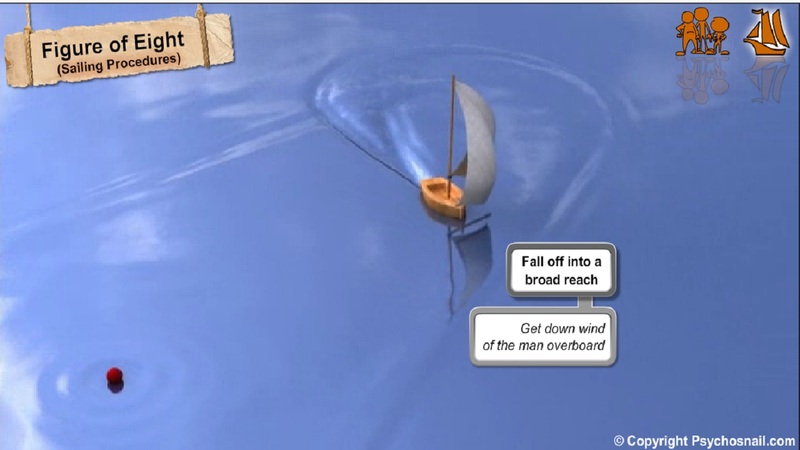 Stay as close to the man overboard as possible. Leaving the head-sail cleated, head up (into the wind) and tack. Leave the rudder hard leeward (turned so that if allowed to go the bow would turn into the wind). Hove to, with the rudder hard to leeward and the head sail backward the boat will stop. If you are quick enough and the person is within reach throw a floating line. If they are out of reach, start the engine, lower or furl the headsail and sheet the main midships. Make sure there are no sheet or lines that can be caught in the propeller. Motor to the leeward side of the person and motor up head to wind, to the person.